The energy frontier allows physicists to pursue the highest-energy phenomena accessible by modern techniques. Fermilab is a high-energy physics laboratory. Did you ever wonder just exactly why high energy is something that physicists like? After all, there are many superlatives to which a laboratory might aspire, like having the fastest computers or most powerful laser. What is it about high energy that makes it attractive? There are at least three reasons why energy matters. The first involves Einstein’s famous equation E = mc2. Simply put, it says that energy and mass are equal, up to the c2 term, which is really nothing more than a conversion factor, used much like how you would convert inches to feet. Thus having high energy means you can make high-mass particles. Indeed, until the Tevatron began operations, it was impossible to make top quarks, which have a good deal of mass, in a laboratory. The higher energy available at the LHC means that researchers have the ability to make even higher-mass particles. A second reason to use high-energy beams stems from the world of quantum mechanics. People are comfortable with the idea that light has a wavelength. What is a lot less obvious is that matter also has a wavelength. Further, for both light and matter, wavelength and energy have an inverse relationship: the higher the energy, the shorter the wavelength. The reason we like a shorter wavelength is that acts as a more precise probe, allowing us to see smaller things. Studying the protons and neutrons is now old hat, and even studying quarks is something we’ve been doing for nearly forty years. In order to see if the quarks have something inside them will require even shorter wavelengths. Given that there is circumstantial evidence that quarks are not the final story in mankind’s long quest to find the smallest building blocks of matter, there is a strong motivation to make higher-energy beams as a way to find the next layer in the quantum onion. High-energy collisions like this one recorded by the CMS detector at CERN allow us to recreate the conditions of the early universe a mere trillionth second after the universe began. This is but one reason why producing the highest-energy collisions possible is a pursuit of particle physicists. The third reason to make very high-energy beams is that high-energy collisions result in the hottest possible temperatures. 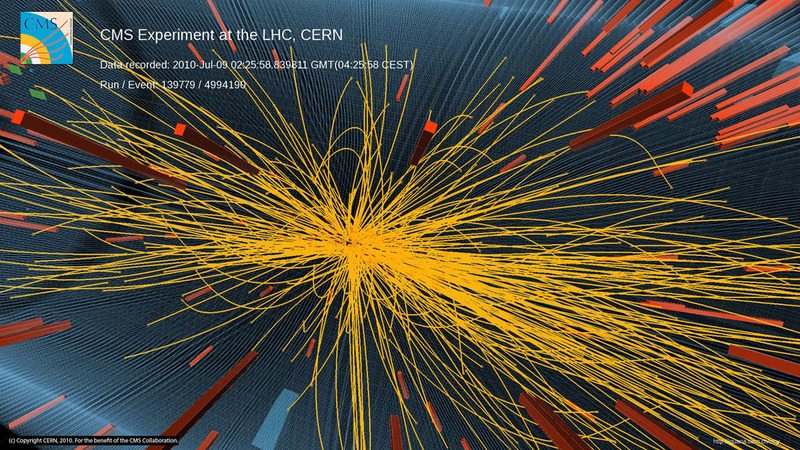 An LHC collision can generate temperatures that are 100,000 times hotter than the center of the Sun. While studying the behavior of matter at high temperatures is an interesting thing in its own right, these studies have a cosmic significance. The universe was created in a cataclysmic explosion that we call the Big Bang. In that early fireball, the universe was much hotter than it is now. In fact, collisions at the LHC can heat matter to temperatures last common in the universe 14 billion years ago, a scant trillionth of a second after the Big Bang. 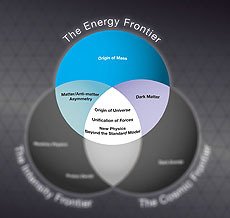 Higher-energy collisions allow us to peer further and further back in time, approaching the moment of creation itself. These three features are interrelated. If we learn more about heavier and smaller particles, we will learn more about how the universe came into existence and will better understand the building blocks of the matter that make up everything we’ve ever seen. These ageless questions have troubled mankind for millennia. More energy brings us closer to the answer.